This dress is truly one of a kind. My guests still talk about it! Gorgeous french bustle adds a dramatic change for the dress when ready for the train to be lifted (see photos).My dress is truly beautiful and it pains me to separate myself from it but I know I no longer have a use for it. What first attracted me to this gown was the fit to flare form. 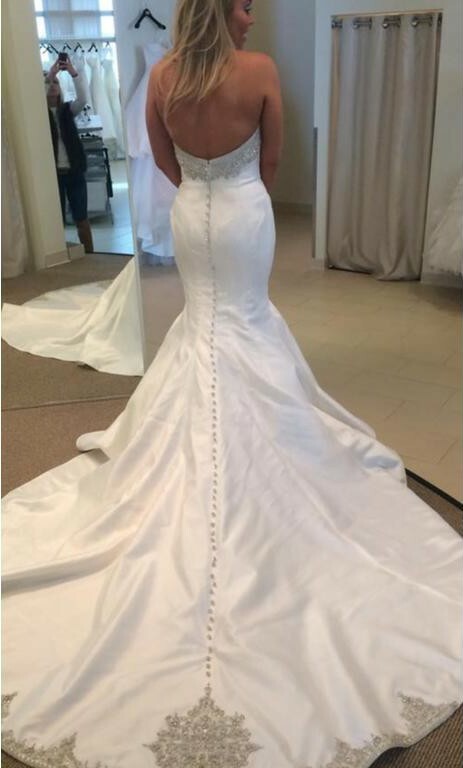 There is also a beautiful dramatic back with crystal buttons running down the full length of the dress and flawless beading on top that makes It look even more regal. I spent a great deal of money having a full bustle created since I knew I wanted to dance. However, bustled or not this dress looks and feels amazing. More importantly, it also photographs well! This dress has not been professionally cleaned but shows looks like new. Once you send a message, Corrinne can invite you to purchase the dress.